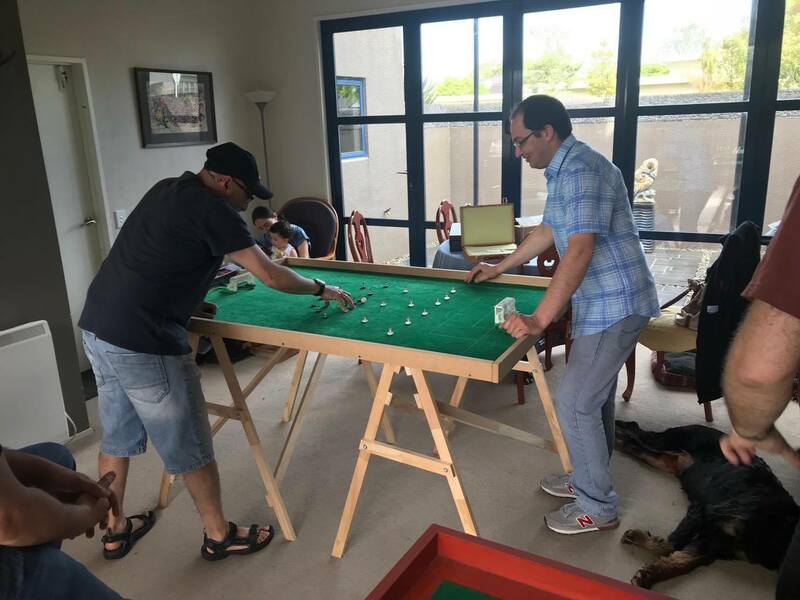 It was a beautiful spring day that trans-Tasman rivalry took shape in Sports Table Football. 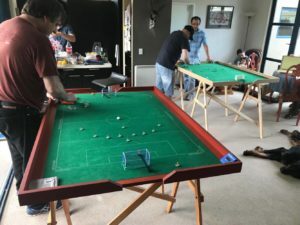 Adrian Connolly of Melbourne Club Western Flickers was in the “land of the long white cloud” and took the opportunity to fly down from Auckland to the Middle Earth of Table Football, Palmerston North. Some friendly warm up games over fesh and cheps (otherwise known as fish and chips elsewhere in the world ) were held between local champion Ignacio Lopez and Adrian the night before the big event, which was held on Saturday 28th October. Three local players took on Adrian – the host and local champion Ignacio Lopez, Rodrigo Cardenas, and David Pacheco. Jokes about Chile’s lack of qualification for the FIFA World Cup were not allowed, though that didn’t always stop David (of Mexican decent)! A round robin format was adopted, with the top two playing off in the final, and the bottom two competing for 3rd/4th positions. In the remaining rounds Adrian took quite a liking to the “home made” pitch created by Ignacio’s brother! Commercial fields should get advice on how to do line markings from him. Meanwhile, Ignacio set himself up on his Chilean home ground Pegasus surface. Both Adrian and Ignacio comfortably accounted for their opponents who are were learning the game. Games also served as coaching exercises for the newcomers who both showed early promise and sound defensive blocking techniques. Rodrigo took out the 3rd/4th play off with a comfortable 2-0 win. The final though was a close and tense affair between Adrian and Ignacio with the latter rising to the occasion. Adrian took an early lead but later in the half Ignacio equalised to go into the break level at 1-1. However, straight from the flick off, Adrian recaptured his lead. The tension increased when Ignacio again equalised. Adrian went straight on the attack again and soon regained his lead. In the end Adrian was happy to walk away with the 3-2 win in a final the fitting finale of the first ever trans-Tasman tournament. Watching the rapid improvement of the local players was the biggest highlight of the event. A big thank you to Ignacio and his family for their hospitality. Let’s hope that soon the Australian-New Zealand rivalry grows even further.